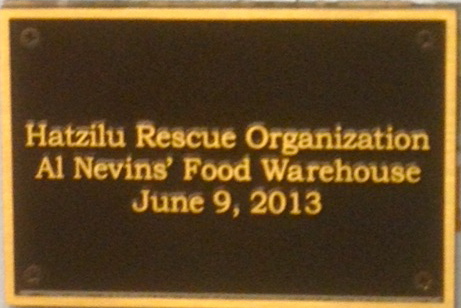 HATZILU MOVES TO A NEW WAREHOUSE AFTER 22 YEARS! May and June traditionally bring many of life’s bittersweet moments-- school graduations, moves into new apartments and homes, among others. While change is always a bit difficult, it also brings an exciting new beginning. Such is the case for Hatzilu’s move to a new warehouse. While we had a long, congenial relationship with the Farina family at the South Shore Ice House for 22 years, it was time to move on. We are fortunate in that we now have new and terrific on-going sources of food. Thanks to the generosity of many synagogue tzedakah programs, rockCANroll, L.I. Cares, Island Harvest, local schools, our Hatzilu B’nai Mitzvah Program, and many big-hearted individuals, we are so well endowed with food, that we outgrew the Ice House. Our new warehouse is now housed in the South Baldwin Jewish Center. We have a larger and more organized space for all the food and supplies that deliverers bring to the homes of our clients on a regular basis. Dona and Ted Schwab, managers of the warehouse, keep the warehouse in organized and pristine condition at all times. We received additional shelving and a new commercial freezer, and await a commercial refrigerator soon. Once we obtain the refrigerator, we will be able to offer our clients perishable foods, produce, and bread occasionally, items that previously we had to turn away due to the lack of a refrigerator. Two supermarket wagons are housed in the warehouse so that deliverers can fill their wagon with food that their clients need, bag the food, and then deliver it directly to their clients’ homes. Hatzilu looks forward to many years of meeting the needs of Jewish people on Long Island, who often have nowhere else to turn for food. Additionally, We are very proud that we can serve our clients and relieve some of their burdens! For more information see "Food Programs"